fall free dining | Eat.Breathe.Sleep.Magic. Paying attention to the historical free dining information of years really helps you decide when to go and where to stay to give you the best shot of getting a free dining discount for your 2018 Disney vacation. Normally, it’s announced in late April/earlyMay. In 2017, Free Dining was released on April 24, 2017. Here were the room exclusions for 2017 (and I would expect to see the same for 2018): all suites, campsites and 3 bedroom villas have been excluded from this offer, as are the Little Mermaid rooms at the new Art of Animation Resort, Port Orleans French Quarter, All-Star Movies, Villas at the Grand Floridian Resort and the new Villas and Bungalos at Disney’s Polynesian Village Resort. All other Disney resorts, including value resorts are included in the offer. Also, Port Orleans Riverside was available, but only for arrivals August 21 through September 20, 2017. Disney World vacations only require a $200 deposit to book and that deposit is 100% refundable up until 30 days before your departure date. Since we expect free dining to be released at the end of April and we’ll know all the details of Fall 2018 then, there is NO risk to you to book now. Historically, Free Dining has been a fall/early winter promotion and based on past promotions, you can plan your visit to give you a good chance of being included in 2018’s free dining discount. But predictions are obviously just that, and all of this is subject to change based on occupancy trends and projections. Being flexible with your travel dates and where you stay helps increase your chances of a great free dining discount! Last year, there was no early booking window for Disney Visa cardholders, but there was an expanded date range. The three years before, Disney Visa cardholders did have an early booking window. Most years, the general public is able to book Free Dining packages 5 days after Disney Visa cardholders can book. In years past, Free Dining has been announced in late April, with booking opening first for Disney Visa credit card holders and the general public a few days later. Last year, there was no early window for Disney Visa cardholders. However, Disney Visa cardholders were able to book free dining starting August 13 vs. the general public start date of August 21st. If you need personalized help with planning any aspect of your vacation, or want someone to book the Free Dining promotion for you and provide other assistance along the way–I recommend contacting me, a no-fee vacation planner working for an Authorized Disney Vacation Agency, Fairytale Journeys, to get a quote and to help you plan. I’ve been planning people’s dream vacations for almost 6 years now and LOVE it! Last year I worked tirelessly for all my clients to get the discount applied to their vacations. In order to grab the free dining discount, I checked very very early in the morning (3am!) & had emailed all my pre-booked clients before I moved to new bookings & quote requests. The longer it takes to book/apply the discount, the less availability there is. Being pre-booked made the process go much faster! Disney World Free Dining 2017 is HERE!!! Guests staying at a Walt Disney World Value or Moderate resort will receive the Quick Service Dining Plan for free. Guests will be able to upgrade to either the Disney Dining plan or the Deluxe Disney Dining plan by paying the price difference. To upgrade to the Disney Dining Plan, the increased cost will be $19.86 per adult per night of your stay, and $3.41 per child. You must also include either the Hopper or Park Hopper Plus option on your park passes to qualify as well. Availability is extremely limited, and must be booked by July 7, 2017. *For Disney VISA Cardholders, the 2017 Disney Free Dining travel dates will start August 13, 2017, all other dates are the same. It also appears availability, especially at deluxe resorts, is much better with the Disney VISA discount. It appears that all suites, campsites and 3 bedroom villas have been excluded from this offer, as are the Little Mermaid rooms at the new Art of Animation Resort, Port Orleans French Quarter, All-Star Movies, Villas at the Grand Floridian Resort and the new Villas and Bungalos at Disney’s Polynesian Village Resort. All other Disney resorts, including value resorts are included in the offer. Port Orleans Riverside is available, but only for arrivals August 21 through September 20, 2017. Three night minimum stay required, and a maximum stay of 14 nights is allowed per reservation. You must also purchase a minimum 2 day park pass that includes the Park Hopper or Park Hopper Plus per person per reservation to qualify. 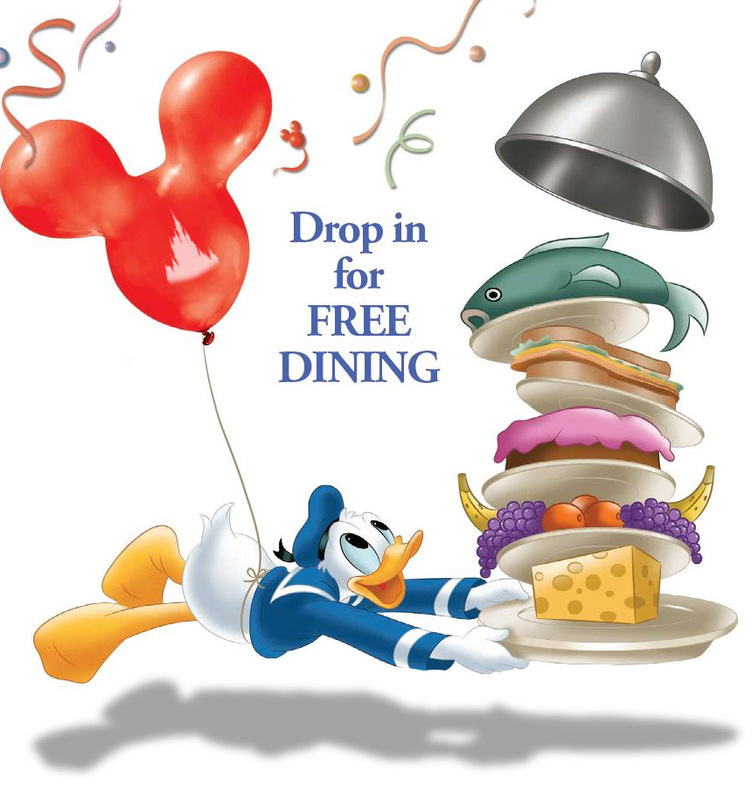 2016 Disney World Free Dining is Here!! Finally – Walt Disney World has announced its annual Disney Free Dining Discount! Please note that in order to qualify for the free dining offer, your must check in during one of the available dates above. Your stay can extend into one of the black out periods and you will still receive the free dining for your entire stay. Availability is extremely limited, and not all resorts may be available. Guests staying at a Walt Disney World value resort will receive the Quick Service Dining Plan for free. Guests will be able to upgrade to either the Disney Dining plan or the Deluxe Disney Dining plan by paying the price difference. To upgrade to the Disney Dining Plan, the increased cost will be $19.86 per adult per night of your stay, and $3.41 per child. You must also include either the Hopper or Water Park Fun and More option on your park passes to qualify as well. Availability is extremely limited, and must be booked by July 8, 2016. Port Orleans Riverside is available, but only for arrivals August 23 through October 1, 2016. Three night minimum stay required, and a maximum stay of 14 nights is allowed per reservation. You must also purchase a minimum 2 day park pass that includes either the Hopping or Water Park Fun & More option per person per reservation to qualify. As we get closer and closer to the end of April/beginning of May, the free dining rumors are FLYING!! 1. I expect to see something soon (assuming Disney releases free dining). My own personal guess for a release date? Monday, April 25th But it could be anytime now really! There is no word yet on whether Disney will release Free Dining to Disney VISA cardholder first, but if they do, I expect that to happen April 21st. Keep in mind there is no way to know if these are the correct dates, but if those dates turn out to be correct, you would just need to check in on one of them to get the discount for your whole trip. If offered, it will mostly likely require a three night minimum stay, and a minimum of two ticket days (with either a park hopper or water park option). And I cannot stress enough these are just rumors and not verified AT ALL. Also, the availability is expected to be EXTREMELY limited this year. Even those who get in first for this discount won’t all be able to secure free dining. I have a list of people wanting to know as soon as I do when free dining will be offered for 2016. Availability is extremely limited, and must be booked by July 10, 2015. It appears that all suites, campsites and 3 bedroom villas have been excluded from this offer, as are the Little Mermaid rooms at the new Art of Animation Resort, Port Orleans French Quarter, All-Star Movies, Villas at the Grand Floridian Resort and the new Villas and Bungalos at Disney’s Polynesian Village Resort. Port Orleans Riverside is available, but only for arrivals August 28 through October 2, 2015. All other Disney resorts, including value resorts are included in the offer. Again, this is JUST a RUMOR right now…. As we talked about earlier, Free Dining might be announced for Disney Visa Card holders on April 27. Everyone else might be able to book on May 1. Again, these are just proposed dates. I would be surprised if it started that early in August. I would add to that list all 3 bedroom Villas, The Villas at both the Polynesian Village Resort and the Grand Floridian Resort and Spa, and the campgrounds at Ft. Wilderness Campground.